“Back then every boy had a major league baseball hero. Mine was Jimmie Foxx. I followed his career, but only got to see him play once because Baltimore, where I lived, was a minor league town. I saw Foxx at an all-star game in Washington. I was ten years old, and I knew he was born in Sudlersville and Sudlersville was on the Eastern Shore. “One day, the Kent Island little league team had a game scheduled in Sudlersville and I couldn’t wait to get there. I asked the man sitting next to me to tell me something about Jimmie Foxx. He said who wants to talk about that guy? I said what are you talking about, he’s a great ballplayer, The Beast. The nonbeliever sitting next to Gil pointed at a house across the street and said Foxx’s relatives lived there. Gil paid a visit and the long-retired power hitting first baseman’s elderly aunt referred Gil to a Florida address. Gil wrote a couple letters, told Foxx about his start-up museum and requested something of a personal nature from his hero. A glove, a cap, part of a uniform – anything. There was little positive response. Then one day, out of nowhere, Jimmie Foxx showed up at Gil’s drugstore, where Gil’s collection of memorabilia was on display. Foxx had brought with him a car trunk-load of baseball history. Forty years later, Gil sounded like he could still hardly believe it. 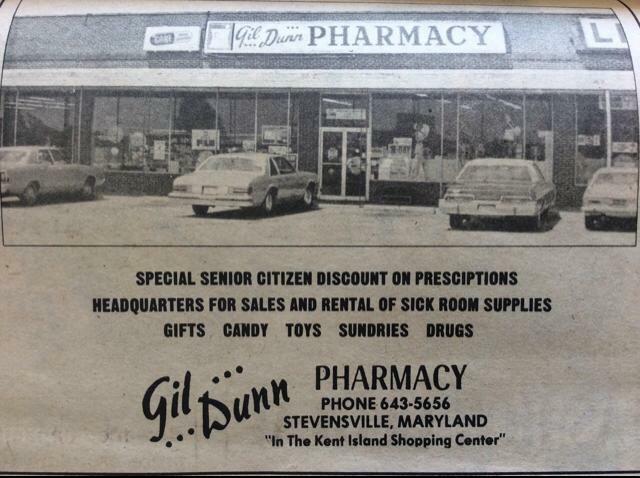 Longtime residents and visitors alike recall Gil Dunn’s Kent Island Pharmacy with great fondness. One of the main reasons is that shrine to baseball, heroes, and honorable intentions that Gil built and shared with the public. Among the precious rarities ‘Double X’ entrusted to Gil was a uniform Foxx wore while playing on an all-star team, with Babe Ruth and Lou Gehrig in the lineup, that barnstormed Japan on a pre-World War II goodwill tour. The uniform is probably one of sixteen like it ever in existence. 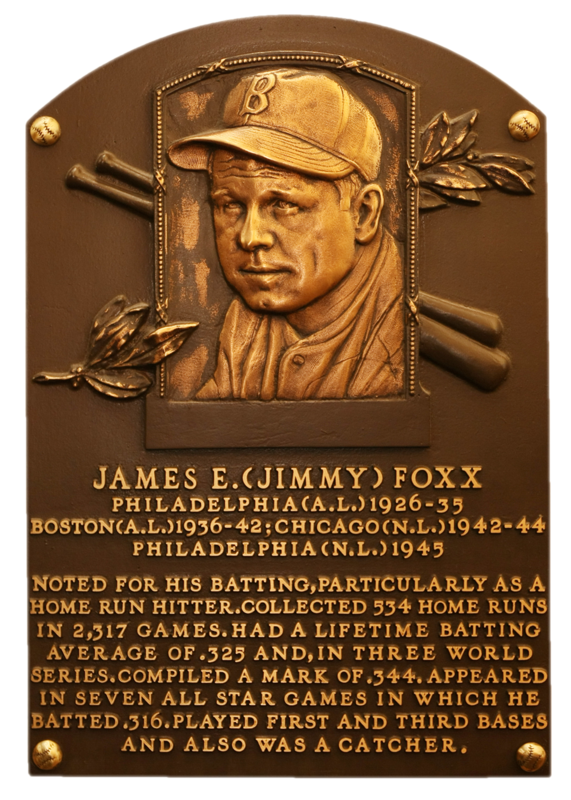 “Hall of Famer Bill Dickey said “If I were catching blindfolded, I’d always know when it was (Jimmie) Foxx who connected. He hit the ball harder than anyone else”. The powerful Sudlersville, Maryland farm boy signed his first professional contract with the nearby Easton minor league club at age 16, and made his Major League debut “before the end of his junior year in high school. “Hall of Fame backstop Rick Ferrell said of Foxx “was the greatest all-around athlete I ever saw play Major League Baseball”. Foxx finally broke out and earned regular playing time at first base in 1929 and led the Athletics to the first of two consecutive World Series titles. “During his career, he was one of the most dominant offensive forces in the majors as he put together twelve 30 home run seasons and thirteen 100 RBI seasons. He captured three American League MVP Awards, was selected to nine All-Star teams and took home the American League Triple Crown in 1933. When he retired in 1945, his 534 career home runs were second to only Babe Ruth and the most by any right-handed batter in big league history. “Foxx was elected to the Hall of Fame in 1951, then in 1952 became one of three Hall of Famers to manage in the All-American Girls Professional Baseball League, along with Dave Bancroft and Max Carey. Foxx managed the Fort Wayne Daisies to a first-place finish in his only season as an AAGPBL manager in 1952. “Hall of Fame hurler Lefty Gomez, who had the misfortune of facing Jimmie Foxx many times in his career, proclaimed “When Neil Armstrong first set foot on the moon, he and all the space scientists were puzzled by an unidentifiable white object. I knew immediately what it was. That was a home-run ball hit off me in 1937 by Jimmie Foxx”. Gil obtained the required education, and when he and Florence arrived on the Eastern Shore, they saw their future. The Bay Bridge was new and Rt.50 was something locals were just starting to get used to. Housing opportunities and the needs of the community were growing. Just off the westbound highway construction had started on the brick and block commercial strip known as the Nichols Building. There was to be a new Acme supermarket and a Fox Brothers department store there. The Dunn’s Kent Island Pharmacy opened in 1953 and became a fixture at ‘the shopping center’ for more than forty years. Gil and Florence raised five children on Kent Island and stayed involved with their extended community through their church and numerous charitable organizations. Among his civic activities, Gil Dunn supported local sports teams and little leagues, is a past president of the Kent Island Heritage Society, and was the founder of the Kent Island Band. And while Gil might be best remembered for his pharmacy, his Jimmie Foxx museum, or his boisterous laugh and genial, joy-of-life personality, for me it’s always going to be in the way he told his stories. I lived on the Island as a kid/teen from 1960 -1970, used to walk or bike to the Acme shopping center and visit Gil Dunn’s pharmacy regularly. I remember thinking an homage to an (to me) obscure ball player was eccentric. My family was, and still is faithful to the Orioles. My younger brother, however, was in thrall of it, as he was a baseball fanatic. I never knew the background story. Thank you for the fond memory! Thank you for taking the time to comment! Glad you enjoyed the post! Wonderful story! I knew Gil Dunn and Ralph Hoyt, when I was a boy growing up on Kent Island. Glad you enjoyed, Fred! Thanks for taking the time to comment! Thanks, Jack! Glad you enjoyed – Hope you’re doing well!